Also news from Leavenworth International Accordion Celebration and other events throughout the Northwest, with PICTURES!! Join now! We feature original music in each issue! 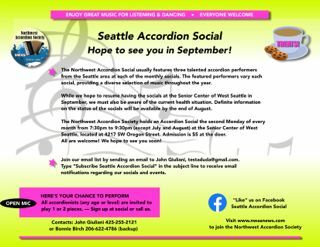 Are you a member of the Northwest Accordion Society? Join NWAS or Renew your membership today! You may select hard copy, PDF or both. Hard copy newsletters are mailed in March, June, September and December. Please send ALL News and Membership related correspondence to the the above address. News about Accordion Clubs and Associations - go to our Accordion Club page! The Leavenworth International Accordion Celebration in Leavenworth, Washington was once again a great success! Sponsored by the Northwest Accordion Society! MARK YOUR CALENDAR NOW FOR 2019! June 20 - 23, 2019! NWAS says THANK YOU to our Leavenworth International Accordion Celebration Sponsors! More information can be found on the www.accordioncelebration.org web site. Click here for the LIAC Sponsors page! You may now contribute using Visa, MasterCard,American Express, Discover, or your Bank Card. This is processed through PayPal (you do not have to have a PayPal account to do this). Minimum donation of $10 via PayPal. Business and club donations via PayPal - please email your business name, contact name, address, website address, phone number, etc. to nwas@nwasnews.com. NWAS News is published quarterly by the Northwest Accordion Society to unite membership by providing news and articles that instruct, encourage, and promote the playing of the accordion. The Northwest Accordion Society is a non-profit organization dedicated to the promotion of the accordion. The Northwest Accordion News is a quarterly newsletter published by the Northwest Accordion Society for and by its members. The purpose of the NWAS News is to unite the membership by providing news of its members, and articles that instruct, encourage, and promote the playing of the accordion. When sending newspaper articles, you must include written permission from the publisher for us to reprint as well as a glossy copy of any photographs submitted. We prefer that the articles sent via email or disk be in MS Word or plain text format. If it is a typed, paper copy, please be sure the type is DARK so it will scan into our computer with few errors. If you wish photos returned, you must send SASE of correct size and adequate postage. Send articles to: NWAS, 5102 NE 121st Ave. Unit 12, Vancouver, WA 98682 or email to Judith.L.Ames@gmail.com.